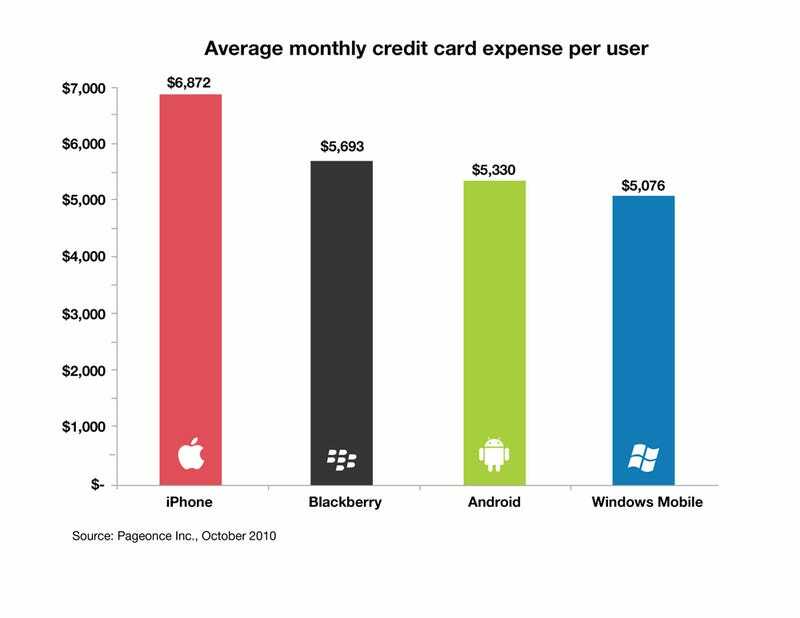 What can we make of this credit card spending by smartphone platform data from Pageonce? That iPhone owners spend like crazy, and WinMo holdouts are probably saving up for a new phone, for starters. The data was taken from a random sampling of 275,000 Pageonce users, and includes at least 5,000 users per platform. And it could mean a whole bunch of things! Either iPhone users spend more money on average, or they have more debt on average, or the simple averaging masks extreme expenditures at the high and low end. BlackBerry and iPhone are arguably the most commonly used enterprise phones, so that might have something to do with racking up higher monthly charges. The iPhone came in a surprising fourth here, possibly because it's only offered on one carrier so there aren't any aberrant deals affecting the average. I can't read much more into it, though. My eyes are too blurry with tears for the poor souls paying that much for WinMo every month.